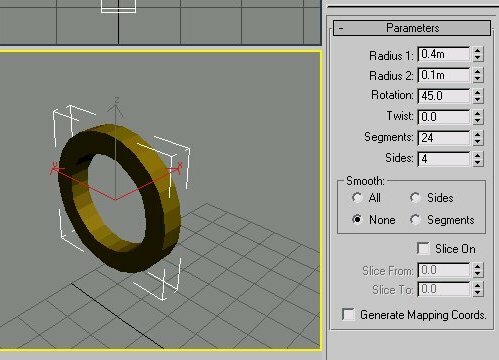 In this section you will learn how to make a wheel, you will need 3D Studio max 5 and the official RA2 exporter from the ra.com site. This is only one way to do it, but it works for me, and others. Note: you can follow this tutorial in max 4.?, only the rendering to texture and uvw mapping are different, use the tutorial files with max to learn how to do this. description = Wheel made for tutorial. Also in the components directory create a folder called carwheel, and a subfolder called maps. Now you are ready to start max. Before you start, open the 'Customise' menu in max and change the units setup to be in meters, this helps in scaling your parts to fit in the game. 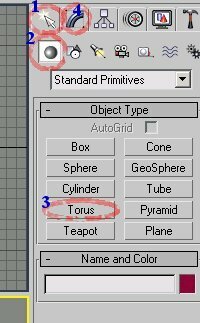 In max create a torus by following steps 1-3 then dragging in the left had viewport, then click on the modify tab (4) ready to change its shape and size. 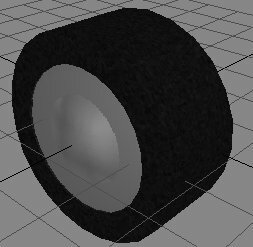 Now to make the tyre wider, in the modifier panel expand the rollout and select vertex, all the vertices of the mesh should now be visible as blue dots. Click and drag to select all the vertices on one side of the wheel, click on the move button at the top, then the Absolute Mode button at the bottom. Use the up and down arrows next to the x axis setting to make the tyre wider, about 10 clicks does it. Now to make the rubber effect. 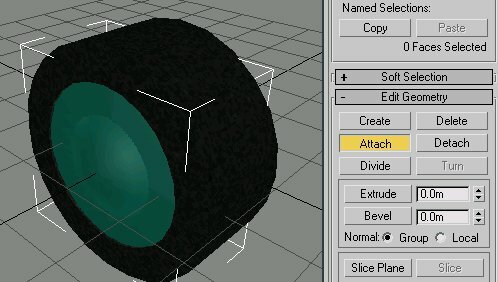 Open the material editor , , and select any of the materials by clicking on the preview spheres in the top window, then rename it to tyre. In the 'Blinn Basic Parameters' rollout there is a small button to the right of the diffuse colour, click it to get a new window, in this window double click 'Noise'. Now change the noise parameters to match the picture, and click the show in viewport button. Back in the main window, select the mesh, then hit the apply to mesh button in the material editor. Now you need to add a uvw mapping modifier to the mesh. With the mes still selected click on 'Modifier List', scroll down and select 'UVW Mapping'. Change the parameters to cylindrical and check 'Cap', you should get something like on the right. The tyre looks nice (well maybe it doesn't) but RA2 cannot recognise the 'noise ' material type. You have to 'bake' the texture, or 'render to texture', to make a bmp file that RA can use to map onto the tyre. 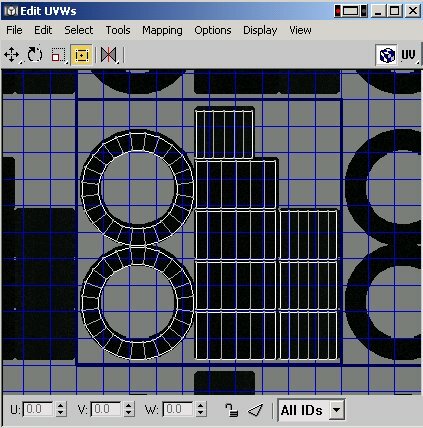 In the moifier stack, right click on the UVW Mapping and select 'collapse to'. 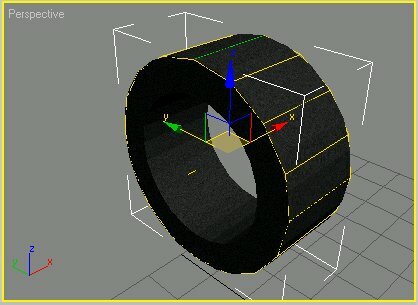 Move the tyre mesh so it is at 0,0,0 in the scene by clicking on the move tab, turning off the Absolute mode at the bottom, then typing 0.0 into all the x y and z box at the bottom. From the main menus across the top select Rendring>>Render to texture. In the general settings rollout set a path for the file to be saved to, close the rollout, and open the Selected Object settings. Click on Add..., then complete map, then add elements. Change the filename of the bmp that will be generated to something more suitable, and click render. Now you can see the bmp file that has been saved, close this and the reder to texture dialog. A new modifier has been added to the stack for the tyre now, Automatic flatten UVs, collapse this modifer too. Re-open the materials editor, and click the same button you did before to add the noise material, that now has an M in it. 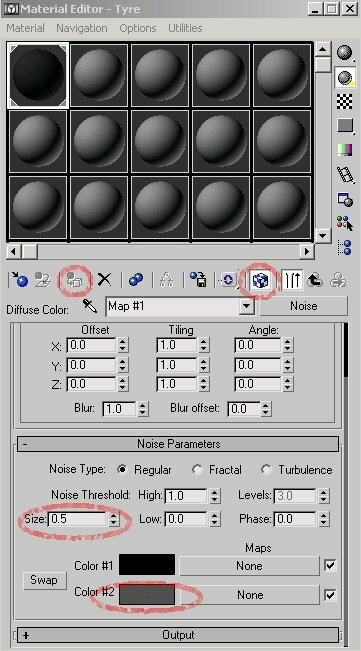 Click the Noise button on the right just below the viewing spheres, doulble click bitmap in the new window, then select the bmp you just rendered. 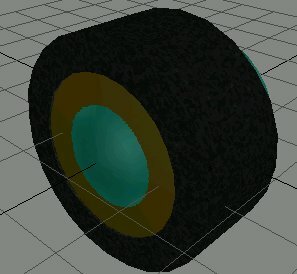 Go back to the modifier stack for the tyre and add the Unwrap UVW. From the menus at the top of the uvw editor screen select Mapping>>flatten mapping, and ok the dialogue box that appears. You now see the tyre split into sections and laid onto the map. Close the editor. 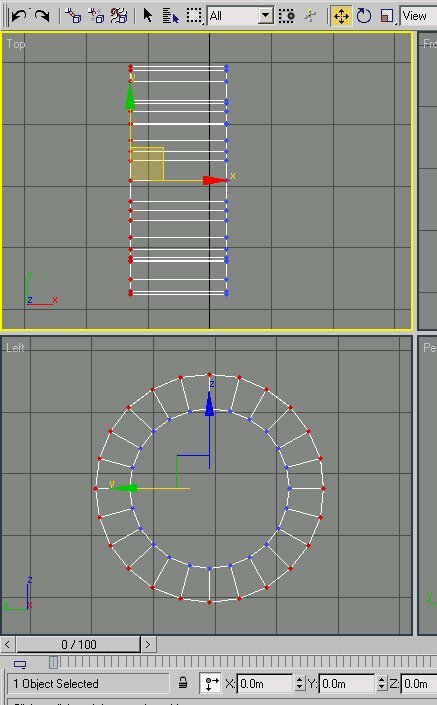 Now to make the rim of the wheel, create in the left viewport a cylinder that is bigger in diameter than the inner part of the tyre but smaller than the outside, convert to editable mesh and move the vertices to make it the right proportions to fit the tyre. 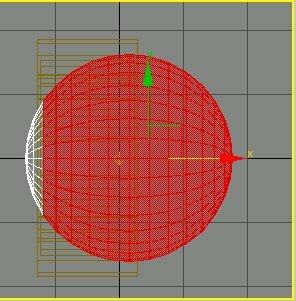 Also create a sphere about 0.4 in radius and convert this to ediable mesh also. 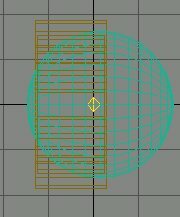 Make sure all three meshes are at 0,0,0 then line them up like the picture on the right. In the Perspective viewport it should look like the rim, and then hubcap (sphere). 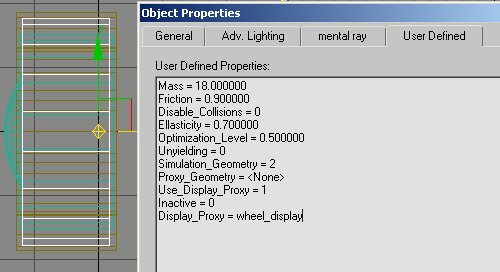 In the spheres modifier turn on the polygon selection tool, click and drag to highlight all the polys that do not make up the hubcap, hit delete and ok the dialog that pops up. Further down the modifier rollout under the edit geometry section there is the attach button, click it and then on the rim in the viewport, the part of the sphere left is now part of the same mesh as the rim. Click on attach again to turn it off. Re-open the material editor and click on a blank sphere, this is going to be the material for the rim. Change the colour of the ambient and diffuse to 225,225,225, set the specular level to 55, glossiness to 20, apply to the rim mesh and render to texture as before for the tyre. When you go back to the material editor to add the bmp, be sure to set the specular and glossiness back to 0 and 10 respectively. Move the perspective viewport around to give a good view of the wheel, select rendering>> enviroment from the main top menus, chage the background colour to something more suitable, then close and select rendering>>render. Set the size to 96x72, hit render, save this bmp as carwheel_preview in the carwheel folder. 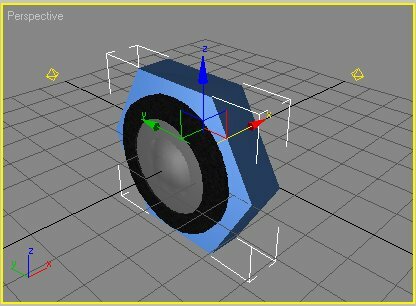 For wheels to work propery in the game, they have to be made facing downward in max, so to start with make sure all the meshes are at 0,0,0 in the scene. 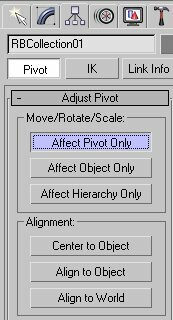 Use the hierarchy tab and turn on 'Affect Pivot Only', you are now free to move the meshes pivot points as you wish without movine the meshes themselves.Turn off the affect pivot only button, select all the meshes, and rotate them through 90 degrees so they point down, then hit the 'reset transform' button lower in the heirarchy rollout. Finally delete all the omni lights. Now you have to group the objects together and assign them to a rbcollection.First select the tyre and rim, then choose from the main menus Group>>Group, when the dilogue appears call the group 'wheel_display', move back to the heirarchy rollout to move the groups pivot point to 0,0,0. Repeat this step for the wheel and wheel_traction meshes, only this time calling the group 'wheel_rbodies'. Goto the create rollout again, pick helpers from the icons across the top, then reactor from the drop down selector. Click on the RB Collection button and click anywhere in a viewport to create one. Right click a couple of times to turn of the create function, select the new rbcollection and open its modifier stack, look for add button, then double click on wheel_rbodies group in the diologue box. Save the scene at this point, then run the gabriel exporter and export the file to the carwheel folder as carwheel.gmf. 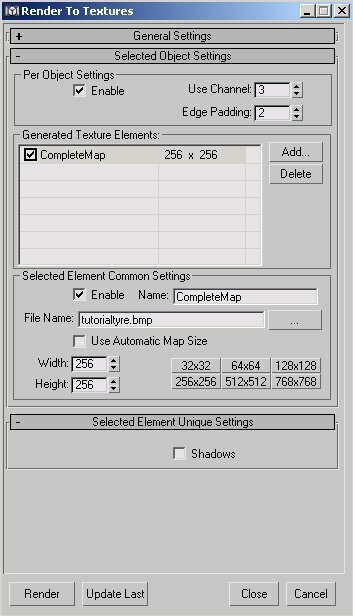 Be sure to check the preferences first, you should be exporting as binary, in meters, and copying textures to \maps. Go test and have fun.